The module simplifies and accelerates administration of orders, bulk printing of invoices and delivery notes, and﻿ printing of product setups﻿. Moreover, the module extends the possibilities of the "Print Postal Documents" module. With the 'Czech Post', 'GLS', 'PPL', 'GEIS', 'Slovak Post' etc. Online Submission modules, the modules enables bulk online posting directly from the list of orders. 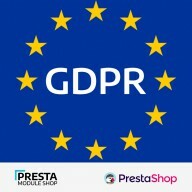 PrestaShop, an open-source solution for e-shops, was developed totally free of charge by a group of software developers in Paris; it has been translated into more than 50 world languages. In spite of constant improvements and upgrades to the system, it has to be adapted by means of various accessory modules in order to enable high-quality work. We offer the Improved Administration of Orders module, which will significantly simplify and accelerate your work with orders in your e-shop. A great advantage of this module is that you can perform a lot of operations directly in the list of orders and do not have to click on each separate order. This module will certainly save you a lot of time. The module is constantly improved and supplemented by additional functions which may significantly simplify and accelerate your work with orders in your e-shop. By buying this module, you will not only gain the advantage of using the module to your entire satisfaction, but also the advantage of getting new updates if there are any. The module enables bulk printing of invoices for all orders selected by you (picture 7 No. 2) or printing of individual invoices directly from the list of orders without the necessity of clicking on individual orders. 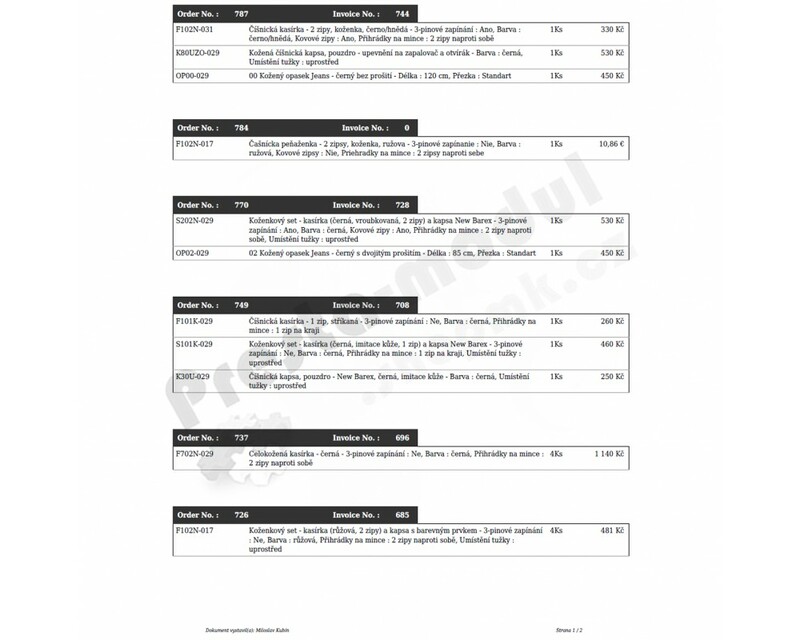 The module enables bulk printing of delivery notes for all orders selected by you (picture 7 No. 3) or printing of individual delivery notes directly from the list of orders without the necessity of clicking on individual orders. When using the Pick Up in Store + Cash Voucher module, the Improved Administration of Orders module enables bulk printing of cash vouchers for all orders selected by you (picture 7 No. 6) or printing of individual cash vouchers directly from the list of orders without the necessity of clicking on individual orders. The module enables printing of delivery notes with zero invoices – it enables printing of delivery notes before invoices are issued so that you can prepare the goods in your warehouse in compliance with the delivery notes and only afterwards print the actual invoices. 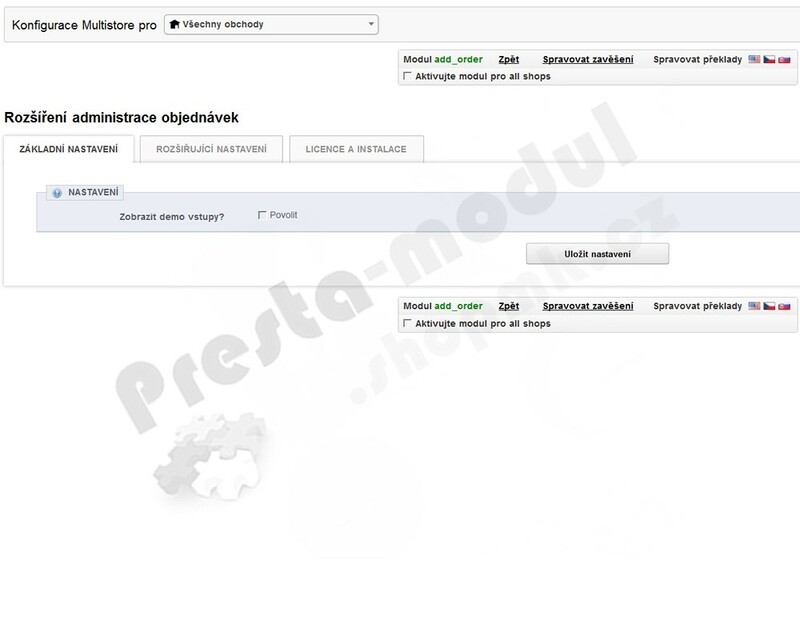 The module enables printing of product setups setups for all orders selected by you (picture 7 No. 4) – setups for easier preparation of goods, suitable for preparation of goods before printing of invoices (picture 11 and 12). Thanks to the module, you can view data included in the orders (carrier, ordered items with quantity and price per item, mailing address, invoicing address) directly in the list of orders (picture 6). 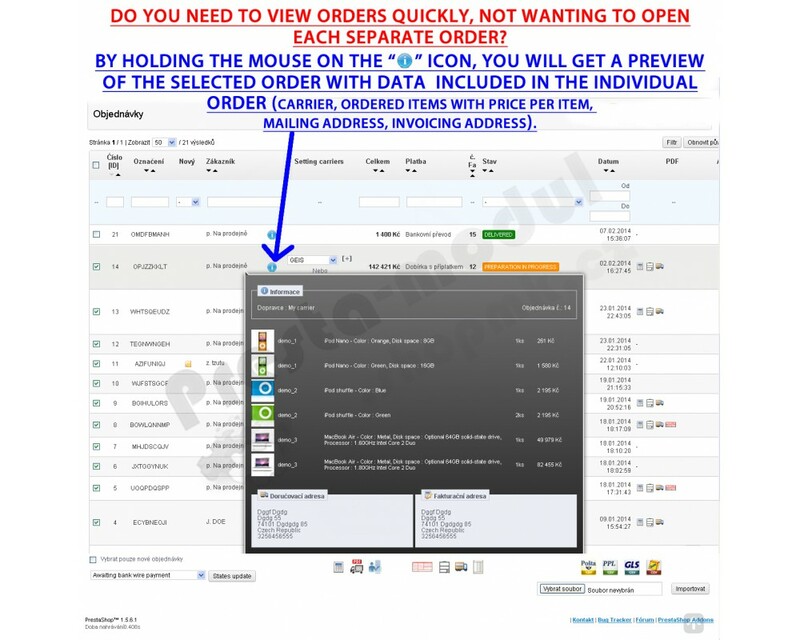 You do not have to click on each order; you can just hold the mouse on the “i” icon of the selected order. When using the Print Postal Documents module, the Improved Administration of Orders module enables selection of orders in the list of orders for bulk printing of postal documents (postal orders, certificates of posting, address labels, posting sheets) and printing of the selected postal documents for all orders selected by you (picture 7 No. 5). Without this improvement, you have to print individual postal documents separately for each order by a selection made directly in the individual orders. The module enables a bulk change in the order status for orders selected by you, e.g. a bulk change from the “Preparation in progress” status to the “Package sent” status as soon as the packages have been handed over to the carrier (picture 7 No. 1). 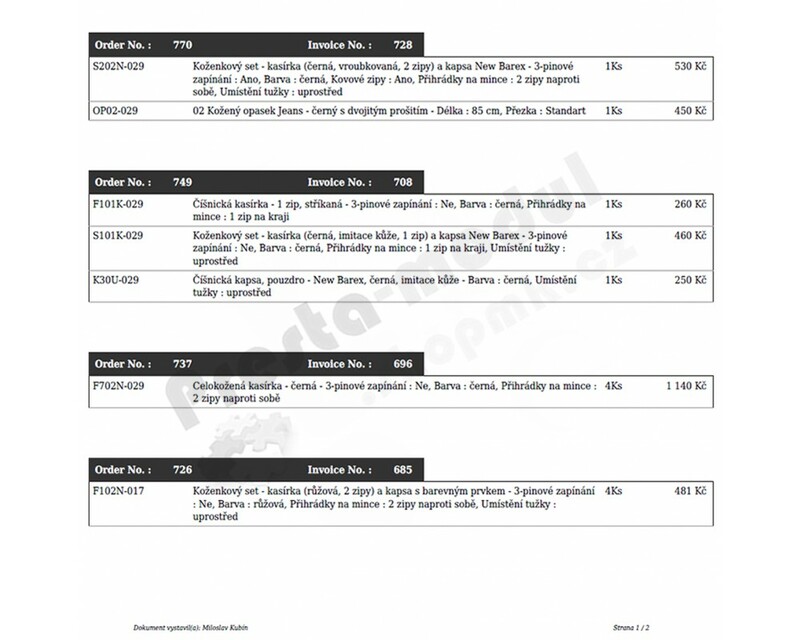 When using the Czech Post, PPL and GLS Online Submission (exp/imp CSV) module, the Improved Administration of Orders module enables easy selection of orders for bulk online posting in the list of orders (picture 7 No. 7). Furthermore, the module enables to edit the weight for individual carriers (the module automatically transfers weight from the order to online posting) and to adjust the default value parameters for individual carriers directly in the list of orders (picture 8 No. 3) – possibility of specifying the type of shipment, number of packages, extra services (notifications, additional insurance …). 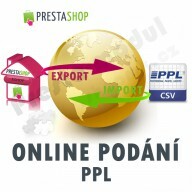 Thanks to the module, you may select which order statuses will enable export of orders to online posting. 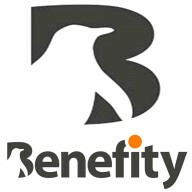 THE MODULE MAY BE ADAPTED, FOR A FEE, FOR OTHER MODULES FOR ONLINE POSTING THROUGH CARRIERS DELIVERED BY YOU. 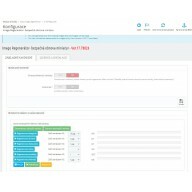 The module enables entering of the shipment tracking number (picture 8 No. 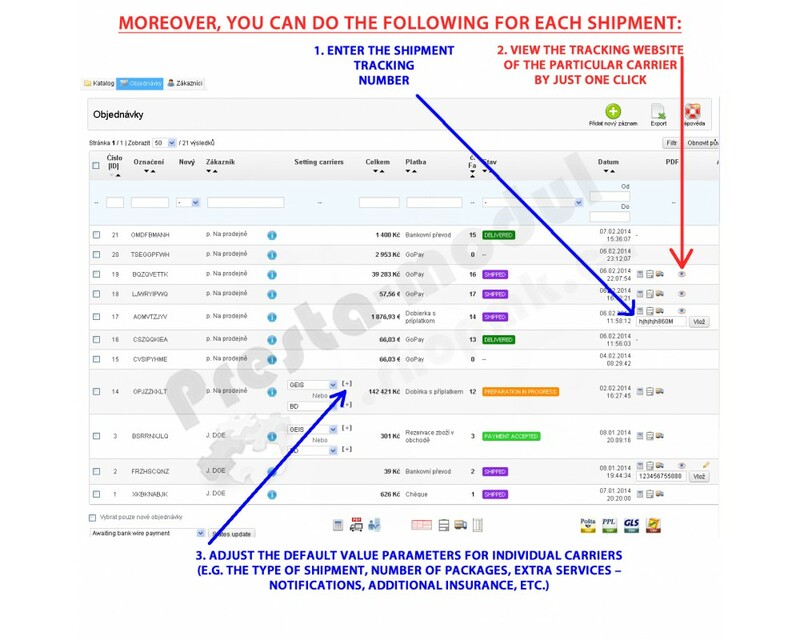 1) and subsequent tracking of the shipment at the website of the given carrier by just one click directly in the list of orders (picture 8 No. 2). 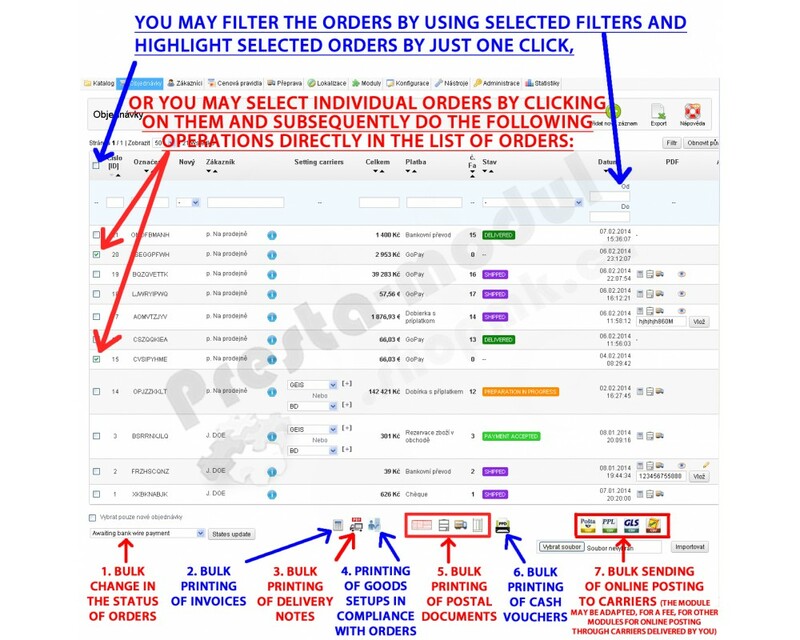 When using the GEIS Online Submission (exp/imp CSV) module, the Improved Administration of Orders module enables easy selection of orders for bulk online posting in the list of orders (picture 7 No. 7). 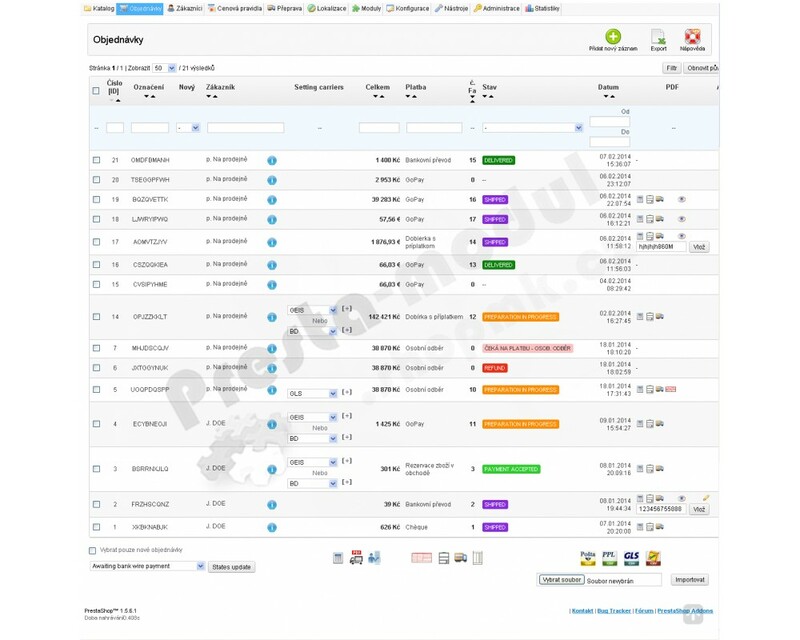 Furthermore, the module enables to edit the weight for carriers (the module automatically transfers weight from the order to online posting) and to adjust the default value parameters for the carrier directly in the list of orders (picture 8 No. 3) – possibility of specifying the type of shipment, number of packages, extra services (notifications, additional insurance …). Thanks to the module, you may select which order statuses will enable export of orders to online posting. By purchasing the module, you agree with the Licensing Conditions. The licence enables using the module at one domain only. Do not hesitate and contact us for an unlimited licence or more information. Download the folder containing the “Improved Administration of Orders” module through FTP into the / modules / folder or use the instrument for downloading modules in Administration »Modules» Add a new module. Install the module in Administration » Modules. Go to the module setting and enter the compulsory data and set the necessary default values to enable correct functioning of the module. In the event of an occurrence of a problem, first check the correct setting of all data and default values of the module. If the problem persists, contact the author of the module. I have paid for modules; how shall I download them? You may download them from the link included in the e-mail which has been delivered to you immediately after your payment for the modules. If you have not received the e-mail, we recommend checking your spam box. I have proceeded in compliance with the instructions; however, in spite of that, I am not able to put the module into service. What shall I do? Contact our Technical Support, we will give you advice.